How Do I Remove a Document Stuck in My Printer's Queue? - Ask Leo! Every so often, the Windows Print Queue gets "stuck". Everything looks like it should print, but it won't. We'll clear that up. I’m trying to delete a document in the queue of my printer, but I can’t. It writes “deleting”, but it never finishes. I’ve tried to cancel the same document from the field of my printer but it doesn’t disappear. Restarting my computer, restarting the document, turning off the printer, unplugging the cables, still I can’t. What else can I do? It doesn’t allow other documents to print! This happens too often, and you’d think Windows would have figured out how to handle it by now. When you print a document, it’s not sent directly to your printer. Instead, it gets placed in a queue. Once in the queue, Windows comes along and notices something needs to be printed, and sends it to the printer. It can be really, really frustrating. It’s also easy to fix. You can run many applications on your computer at the same time, and they could all try to print at the same time. Without some kind of organization, that could be a mess. We want the documents printed in sequence, one after the other. Windows handles this by creating what’s called a print queue. When an application prints a document, it’s placed into the queue of documents to be printed. Multiple programs can print to the queue at the same time; Windows keeps track of which pages belong to which document. When the printer is ready — perhaps after having completed printing a prior document — the next document in the queue is printed. The result is an orderly print-out of each document, one after the other. You can view the print queue for each printer by opening the Settings app (or Control Panel, in prior Windows versions), and locating Printers & scanners or Devices and Printers. Click on your printer in the list and click on Manage (in prior versions of Windows, you might need to double-click on the icon corresponding to your printer). Here’s the print queue for my (paused) printer after printing the Ask Leo! home page. If there were multiple documents waiting to be printed, they would all be listed. You can cancel printing a document if it shows up in the print queue: right-click on the document and click on the Cancel option. If the document being printed isn’t listed, you can’t cancel it. Many printers have very large buffers and have received several pages, or the entire document, before they’re done printing. This means the document might be removed from the Windows print queue well before all the pages are printed. But this question is really about the opposite: what do you do when the printer should be printing, the print queue shows several documents ready to be printed, and yet … nothing’s happening? First, check all the “usual” stuff. Is the printer connected and powered on? Is the printer out of paper? Is it complaining about some other kind of fault? Is there a paper jam? There are a lot of things that can stop a printer from printing, and nine times out of ten, it’s one of those issues that gets in the way. Your printer is confirmed ready to print. You have documents in the print queue. Nothing is printing, even though it looks like something should. Attempting to cancel the current print job in the queue does nothing. The solution is to clear the print queue manually, removing all the documents waiting to be printed. This is done on the computer to which the printer is connected. Right-click on the Windows Start menu in Windows 10 (in prior versions, Computer in the Start Menu) or the My Computer icon (on your desktop). Then click Computer Management, or just Manage. In the resulting dialog, expand Services and Applications (by clicking the “greater than” sign to its left), and click on Services. Scroll down the resulting list to find Print Spooler. Right-click on Print Spooler and click on Properties. Now, use Windows Explorer to navigate to the folder “c:\Windows\System32\spool\PRINTERS”2 This is the folder containing the print queue. Return to the Printer Spooler Properties dialog and click on Start. If your printing problem was related to a stuck printer queue, you should now be able to print again. The command prompt must be run “as administrator”, since it requires administrative privileges to access the print queue folder. If it happens often enough, you might even save those commands to a command file. 1: This dates back to days when documents to be printed were written to a spool of magnetic tape which was later physically taken to a different device to be printed. 2: A quick way to do this is to click on Start and then Run — or type Windows key + R — and then enter “c:\Windows\System32\spool\PRINTERS” as the item to run. This will open Windows File Explorer on that location. « Previous post: Windows 10 Home edition gives you little control of Windows Update. I do have a fairly large hammer you can use. Nice explanation. I like the way you provide background facts and also include the mundane possibilities before getting to the techie stuff. This Print – No Print Answer is superb. It is very helpful…I wish I’d read it BEFORE the hassle! I see this regularly while working on customer computers. While Leo’s method is technically correct, there is a much easier way to clear the print queue which works nearly all the time. If there are multiple documents shown in the queue, right-click on the printer and tell it to delete all the documents in the queue. All but the active document will clear. (The queue now shows 1 document) Now tell it to “Pause printing”. While it is paused, tell it to delete the remaining document. IT WILL NOT DELETE but, when you “Resume printing”, it disappears. I’m glad that works for you – and it’s certainly something to try. Gotta say, though, that every time I’ve tried something like that it’s not helped. Obviously I could be very wrong, but my sense is that seems like a very manufactured acronym – as if they were putting things on spools of tape, and then later as technology improved manufactured an acronym that preserved the sense of what they had been doing while accurately reflecting the new way. Just a guess, though. I found a batch file on the internet to clear the print queue. Copy the following text to a text to a blank text document. Use notepad to open the blank document. Text starts at @echo off and ends with net start spooler. document to an executable batch file. and create a shortcut to it on your desktop. When your printer locks up run the batch file to fix it. Works great. echo deleting stuff… where? I’m not sure. Just deleting stuff. I was taught that SPOOL is in fact an acronym for Simultaneous Peripheral Operations On-Line – I never forgot this acronym I learned during my undergraduate studies in Computer Science – I’m glad you set the record straight – good to see! While it’s true that SPOOL is an acronym that goes back at least as far as the IBM 7090, as the earliest example of multitasking, when program and data were read (slowly) from punched cards and copied to magnetic tape that could be read faster when the program was executing, the problem these days arises from the large buffer in a modern printer. Once the print file is in that buffer, there’s not much the computer can do about it. Even if the printer runs out of paper, it will be all set to resume when more paper is loaded. Switching the printer to standby may also be ineffective. If you realise to late that you’re printing the wrong document, the only way to stop it may be to power off the printer and hope that resets everything in it. I used to do this manually, but found a program that does the same. Google “stalled printer repair” and look for the website http://www.fantasticfreeware.com. SPOOL does stand for what the earlier comment said and, in fact DOS (which did exist exist since the 60’s in the mainframe world) did the same Windows does today. The operating system has always been in charge of printing. DOS would simply tell the program that the “line” had been printed but wrote it to hard disk then, another task in DOS fetched the data and printed it. As it is more common for mainframes to have many different printers attached, they all operate(d) simultaneously printing the output of programs executed sometime before. The PC world developed without much assistance from the mainframers (who saw PC’s as toys) and so, the PC’ers often “created” or “recreated” terms. That is why starting a PC is called “booting” it while starting a mainframe is called IPL’ing it (from Initial Program Loading, a term that makes much more sense). Many Windows “inventions” in fact are very old. Case in point “Virtual Memory”. That concept started in the mainframe DOS world around 1975 when IBM went from DOS version 27.1 to DOS VS 28 (the VS stood for “virtual storage”). “V M” in the mainframe world first stood for Virtual Machine”. Thank you, thank you, thank you! I wrestled with this issue for several hours before I found this site. I followed your instructions exactly and it solved my problem immediately! I really appreciate you putting down these instructions in such a clear fashion. Thanks again. It’s not like you, Leo, to be so biased. Now how about providing us all the corresponding instructions for XP (both Home & Pro)? Those instructions work for XP as well. got stuck on that and I’m not available at the time. Hi Leo. Yes, over many years of Windows the good ol’ print spooler has done this to me often enough. Only ever when I am in a tearing hurry naturally. As I have only one printer on only one PC and I never want to print more than one thing at a time can I go to Printer/Properties/Advanced and select “Print directly to the printer”, thus bypassing the spooler? I know that ties up the computer until the print job is finished, but I typically only print a few pages per job and I wouldn’t mind the wait. Would that remove any chance of print spooler problems such as your correspondent describes? This sequence opens the Print Spooler Properties dialog box shown in Leo’s post. Your “common scenario” ends with “rebooting doesn’t help.” In my scenario, as I sit still during reboot, the item suddenly prints, with no action on my part. What is going on? How can that be avoided? I just used this today at the help desk. Worked like a charm – this is a complete from start to finish, Leo you are the man! So, it’s really just Windows preventing Windows from removing temporary files… sigh. If I remember correctly I’ve encountered this issue in every Windows since 3.1 (not sure about 2.0). It’s mighty strange how Microsoft have chosen to leave this glaring bug unsolved for close to twenty years. And counting. Anyhow, it helped me too, and I guess I’ll create a small batch file to automate this. Thanks. Deleting the contents of the folder ends with some printers (like mine) not working and having to re-install the software. You probably should mention this as I knew better than to delete the contents after I got to the end of your instructions I thought no this is dumb but I’ll give it a shot-took your recommendation, Now I have to re-install software AFTER I delete all traces of the old software in system folders…Can’t wait for your next tips on “how to cross the street” where you add in a line that says to first put on your blindfold & remember cars have the right of way unless you’re in the way. Deleting the queue doesn’t involve the printer drivers and software. If they then fail and you find yourself needing to re-install them then something else completely is going on. Even looking both ways you can still get hit by a speeding our of control car. Great help tip! It works great! Brilliant! However, my problem more lies in the fact that I make PDFs from a virtual printer. Sometimes after days, weeks or months, when I am producing a PDF, some mysterious PDF pops out that I had tried to make months earlier but failed to print then. I am using Nitro Primo free PDF maker, which always seems to work pretty good, and it is my default printer too, even though I have an HP printer attached to my XP Pro computer too. However, I don’t think that the problem is in the software. The problem, I think, has been stopped-up or congested or constipated PDFs that I tried to make long ago, but never printed until weeks or months later. It is really strange. It is like Bill Gates haunting my computer or something. Really eery, if you ask me. So, do you think that your suggestion here will solve my problem? I deleted the contents of that folder, but there was only one file there; a very large file too: something called, FP00020.SPL, but that was a whopping 248 MBs in size! Wow! Talk about a hard drive space hog running riot! It makes me wonder what other little or large suprises might exist in my Windows folder. Btw, I keep my computer squeaky clean and completely free of any sort of malware including tracking cookies. I am really good with computer security; so, my problem is not a trojan or something. Thanx Leo! Keep up the good work! The infallible way to create a stalled printer queue is to send a document to print while the printer is turned off. Believe me, I know. Many thanks. I had been doing a cold boot, which wastes a lot of time. Thank you!!! Was completely frustrated!!!! You made it smooth sailing!!! Thank you Thank you Thank you!!!! FANTASTIC! Great directions, it worked like a charm. Will definitely bookmark THIS site! Bless you! Thanks so much! Was soooo frustrated! Great instruction. The documents in the Printers folder cannot be deleted because the folder and contents are Read-only. When I try to remove the Read-Only Attributes – it does not allow me. You probably need to run the commands “as” administrator. Why does my computer say I need to be administrator, when I am? Thank you soooo much! Super instructions! Unfortunately, windows won’t allow me to delete teh files because “the file is open in another program” even though the printer is off and I have stopped the spooling as instructed. What should I do? This does absolutely nothing. The documents that endlessly say “Deleting” are still there, not deleting or printing or going away or doing anything. These instructions were excellent! I could not have fixed this without your help. Why does Windows require everyone who buys a PC to be an IT person? Thanks Leo! You are a lifesaver. This issue never happened to me before and I was frustrated when the stuck print job wouldn’t delete and prevented everything else from printing. All other solutions that I found on other websites were for everything except Windows 7. You rock! I got all the way up to the step where I am to open Windows Explorer- finally found it in accessories, but when I open it- it simply opens my document files and no search there reveals the mysterious whereabouts of the file I am supposed to be deleting- what am I doing wrong?I do not see anyplace to enter either Start or run. Thank you Leo! I am not PC savvy and spent all day trying to connect my printer to Windows 7. I tried everything I could find on websites, and even used the services of the printer manufacturer. Only your directions worked to “unstick” my Windows print queue! Bless your heart!! Thanks Leo. That did the trick. W/o this there would have been NO reasonable way for me to divine that solution. thank you so much for your help, i was pulling my hair out! Really got me out out of a pickle ! greatly appreciate it ! THANK YOU! I was at the end of my rope trying to print out my son’s school project. You are my hero. Your solution was a) correct and b) easy to follow. I’m bookmarking this site. You are AWESOME!!!! Thank you sooooo much for the quick advice. Going for an interview and needed much info printed… You saved my day! Great article. How do I get internet coupons to print from a HP computer to a Dell 926 printer. It says that they are printing and shows them as printed and nothing comes out of the printer. When I checked the queue it says they are in there. Any ideas would be very appreciated. Went to print a pdf file, a coupon, but found out later that the coupon was removed, so I was able to print. Went to delete the pdf in the queue and it’s just stuck on deleting. I’ve used your method but still does not work. This fixed it! One of the most frustrating issues I happen upon on a daily basis, and I’m so glad I finally found a resolution! Thank you! Just hooked up a new wireless printer. Could print from one user profile, but not the other. Spent hours trying to resolve issue on my own. If not for this post, I probably would have just bought a new PC. THANKS! Thank you! My wireless printer does this to me a lot and you’ve just saved its life. I was about to go “Office Space” on it. PC LOAD LETTER? This article is priceless. You saved me a bunch of time. Thank you so much Leo! At least once a week I use your excellent instructions for removing a document that is holding up the printing queue. thank you.thank you. thank you! You are a life saver! Thank you so much for your detailed instructions to remove a document stuck in the print spooler. Absolutely a life saver!!!!!!!!!! I NEVER would have succeeded without your help! Thank you so much this really worked first time and I was getting so frustrated. This has a Shortcut to it, that is on my DeskTop. But thank you, all the same. I just might need it. Perhaps when MicroSoft decide not to include a Command method ! P.S. – No; that was not “all my own work” – I would like to give credit where it is due, but I don’t remember who produced it for me – Perhaps it was you, Leo ? THANK YOU THANK YOU THANK YOU THANK YOU THANK YOU THANK YOU THANK YOU THANK YOU !!!!!!!!!!!!!!!!!!! You saved me from writing an ENTIRE college assignment on paper!!! You are a live saver!!! Innumerable thanks. Very good. I can’t see a way to pay you. I just wanted to say “Thank you”. I am not a “techie” and was really dreading doing this. But you made it so simple that even I didn’t have any trouble. You’re a wonderful resource. Thank you, thank you, thank you!! Your directions were clear and concise and best of all, effective! thank you very much for the help…. Oh my gosh! Ditto to every other comment on here. I have been trying to fix this for three days! I was about to have to go print my payroll checks somewhere else (while weeping from frustration). Your directions were clear, concise, and easy to execute. You just saved me — and my printer. I was about to go all Office Space on the MF. You should really consider adding a donation box. I would have thrown you a few bones today for sure. Again, thanks so much!!! Consider yourself bookmarked, and a little worshipped. You can always buy Leo a Latte… he loves those! The link is down at the bottom of the page too. 5. As Leo stated “use Windows Explorer to navigate to the folder c:WindowsSystem32spoolPRINTERS”. If you still cannot print, you have a corrupted driver. Remove the driver that you are printing to. 2. Make another printer as a default print. Right click >> set as default. 5. Go to Driver Tab and remove that driver. 6. If it cannot, do it in safe mode. Same step. 7. Visit your manufacturer website for the latest driver. 8. Reinstall reinstall the driver. If you want to kill all of your print drivers. 1. Go to Safe Mode (restart clicking F8 until it prompts you to). OMG Thank you. So quick and easy, why isn’t it all? thank you so much, I just removed a stuck document in my queue by following your instructions!!!!! Oh, you are a genius. I swear. After getting the same document getting printed at least 15 copies when all I wanted was one copy, I decided to search for help and found your life saving answer. Thank you sooooooooooooooooo muuuuuuuuuuuch. May GOD bless you. brilliant! with such simple stepwise instructions that were so easy to follow and worked!! Many thanks for the clear instructions, Leo. This page is now on my Favourites bar for quick access when needed! BRILLIANT! Thank you. Was pulling out my hair. Worked like a charm. How do you delete the contents of the folder? This worked perfectly!! Wish I would have read this first before I got frustrated last night and gave up trying to make it work. Very glad I didn’t smash my printer…thanks Leo!! No matter what I do, including following your directions my printer que will not clear up. As a matter of fact I show that there are 30 files ready to print and when I go to c:/windows/system32….. the print que is empty. This was very helpful and got my printer back online!! Thank you for the succinct instructions. Thank you for providing this service. I was able to follow the instructions and get the printer back to printing. I really appreciate your instructions. Thank you very much. The instructions are awesome. My problem is solved. Thank you again. I was able to clear my queue of all files. But I had some problems on the delete contents of this folder step but for some reason I was able to delete all the files in my printing queue. My deepest thanks. Should I encounter this problem again I will follow the instructions given to me by you. Thank you so very much! I read so many articles that did not make sense to my non-computer mind. You kept me from going crazy trying to fix this!!!!! Excellent instructions that work! There is an alternative way to clear the printer queue with a simple FREE program I’ve used for years. Works every time with ONE CLICK and is perfect for computer novices. It’s called “Print Queue Cleaner” found at mikesmagicbox.com. Most current version is 2.0. Did not help because I have Windows 10 and none of this applies. It works for me in Windows 10 exactly the same way as outlined in the article. It might be that you have an issue with the driver. I’d try uninstalling and reinstalling the printer. I’m a law student, but not very tech saavy. Every time I have an issue that holds up an assignment, I find the answer on your site. Thank you!!!! “The solution is to clear the print queue manually. This is done on the computer to which the printer is connected.” Which begs the question, what about a network printer? My printer is not connected to any computer, but to my router. In that case, it’s still the same. That document would be in the print queue of the computer initiating the print job. This “cure” didn’t seem to work for my 64-bit laptop running Windows 7; is it possible that it only works for 32-bit systems? (as in the name c:WindowsSystem32spoolPRINTERS)? When I tried to “run” that file…..it wasn’t found. 32 versus 64 should not make a difference. Make sure you’re typing it EXACTLY as specified in the article. Thank you!!!! 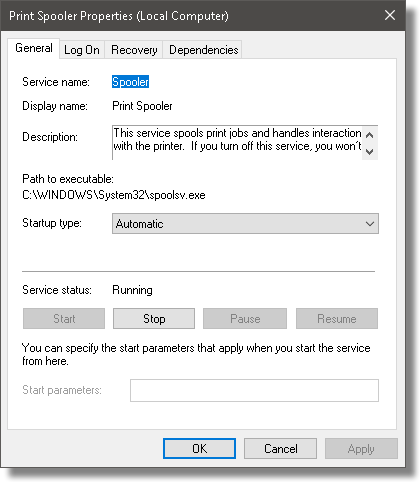 This was a great help, I have Win 10, but was able to find the spooler and continue with the repair and it worked. This was exactly what I needed! Thank you so much!!!! Ditto and likewise to all the comments above! Thank you champion. I had no idea but your instructions were easily followed & worked like a charm. I have a document stuck in the print spooler that shows “deleting”. I tried to follow your above instructions, but could not make it work. I am unfortunately in Windows 10 (don’t ask how I got there – hijacked). Do I need to do something different in Windows 10 to clear the stuck document out of the print spooler? Does anyone else have the answer? Right now, I cannot print anything and would appreciate any help or work-around. it was so useful! i have had many problem with it, but now, solved! Thank you so much. This is the first time I have ever managed to fix a problem using online instructions. They were clear and well laid out. I ‘suffer’ with learned helplessness but this has been a real boost to my confidence. Do you have a solution for Windows 10? There are a few ways to do that in Windows 10. One was is to click on the Start icon or press the Windows key and start typing ‘printers’ without the quotes. Click on Printers and Scanners. Click on the printer whose queue you want to clear. Then click Open queue. From there you can follow the instructions in the article. Amazing. Does exactly what it says. Thank you so much. what happen to my printer ?? Your a champion. Instructions I nutted out and I am printing again. Thank you so much. Thank you. Simple instructions and all correct. One thing left out is if you have more than one computer on the network you must complete these steps for each computer. I finally found the “stuck” item in the laptop & removed it and *finally* my computer stopped printing millions of copies of something I only needed one of! Thank you so much, worked perfectly! I use a computer that I share with other people and I’m not the admin (the main user) of the computer. When I go right click on “my computer” and then go to manage I need the admin’s password which I don’t know. I can’t get through and I don’t think my friend would like to give me his password and I don’t want to know that I caused a problem for his computer. I need help. You’ll have to have him help — probably by clearing the print queue for you (assuming that’s why you posted this on this article). I have tried every suggested website and then I found yours and WHALAH … magic, problem solved. you are my guiding light from now on. I have found that most often paper is stuck in the printer! There’s a utility from 2009 called Stalled Printer Repair. It clears the printer queue with one click. I’ve been using it for years and have it installed on Win 8 and XP, so I assume it will work with 10. It says it is from FantasticFreeware.com. One of the few times that I went through a fix step by step and it worked. You really know how to explain things to us amateurs. THAK YOU! For once, the “Answer” on the internet actually worked. HELP! I did the steps outlined above and it did clear my print que BUT now when I go to print a document it quickly shows up in the print que and then disappears and DOESNT PRINT! Help please what have I done? I did reset the network connection to the wireless thinking that might help but it’s doing the same. This actually worked! …and I’m not all that technically oriented. Thank you so much! Thank you for this!!! I was almost pulling my hair out before i saw it!! yup. years later, I can’t believe this is so difficult 🙂 This article saved me some frustration.